The Intermediate Professional Support is a yearly renewable service that is recommended for companies which are increasing their availability services and requires a non-based cases support model with a coverage of 8×5. Discounts available acquiring more than 1 year of this Support Plan. This support plan includes updates, hotfixes, quick protection for security flaws and direct assistance from our engineers. The Security Analyzer package to detect and fix weak configurations and security threads is available with this support plan. 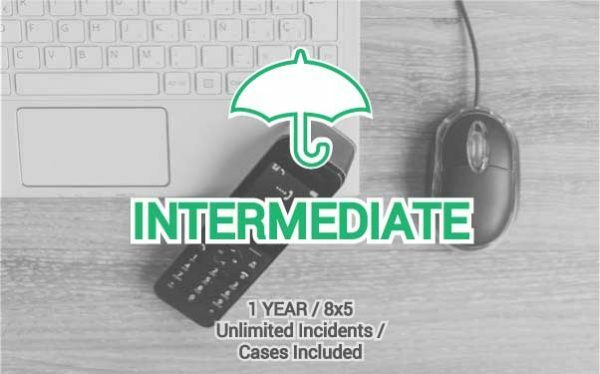 During a whole year, there are available unlimited cases to be assisted by our Team in a maximum response time of 8 working hours and a coverage of 8×5 model for business days. Limited to a maximum of 4 clusters (8 nodes). Free Product Upgrades not included, an extra fee will be required to upgrade the nodes to an upper product version. Private chat enabled but no remote assistance available. Need more? Check out the Support Plans available. All ZEVENET and Zen Load Balancer products are supported (Virtual, Bare Metal and Hardware) for any current and upcoming Community or Enterprise Edition releases. This support service must be acquired a part of any of our products. Cases would be requirements, doubts or issues reported being analyzed by our Team regarding ZEVENET or Zen Load Balancer Editions. Bugs or software faults due to our code aren’t considered as cases. What if I need more tickets? You could extend your Support Plan by upgrading to a superior level or enabling this Support level for more nodes. Once you acquire the Support Plan you’ll get a Support Agreement with the terms of the contract detailed, SLAs, Support Contract contacts and access to the Customer Portal for your Team in order to have direct access to our engineers, updates packages, security packages and technical guides. Periodically, your Team will receive updates email notifications and official security advisories.